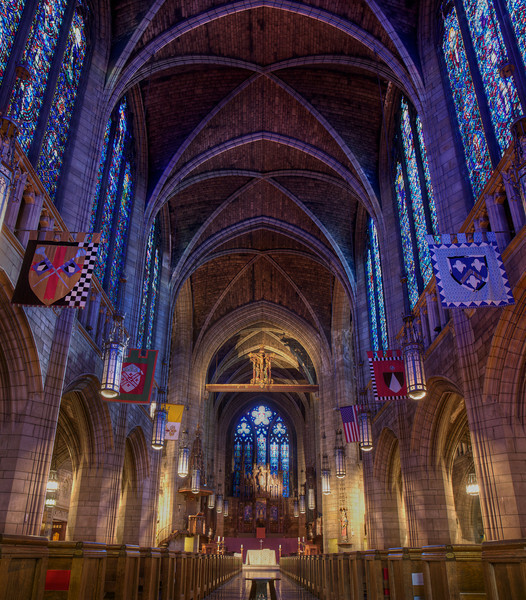 The history of Saint Vincent Ferrer starts in 1867 when the Dominican Brothers and Fathers were charged with founding a parish in New York City. Once established, the Dominicans became popular among New York City Catholics. John Cardinal McCloskey, archbishop of New York and America’s first cardinal, asked the Dominican preachers to establish themselves permanently in the city by founding and serving a parish on the east side of Manhattan, marking the birth of Saint Vincent Ferrer. After borrowing $10,000, the Dominicans secured 18 lots of land on Lexington Avenue between 65th and 66th Streets. On this land, the six priests assigned to this new foundation oversaw the construction of a small chapel, and the first Mass was offered in September 1867. In November of that year, the cornerstone was laid for a more substantial gothic church that was finally dedicated in December 1879. This second church served the growing parish until 1914, when it was dismantled to make way for the present church. During the difficult years of the First World War, the friars and parishioners of St. Vincent’s worshipped in a temporary structure on East 67th Street while plans were finalized for the church we see and enjoy today according to the church website. The church is unique in several respects. First, a crucifixion scene was placed prominently on the façade of the entry of the church. Lee O. Lawrie, America’s greatest sculptor at that time, carved the sculpture. Placing a crucifix outside a church was a very rare feature in American churches and there are few examples to this day. Second, all windows were designed to compliment one another. The position of the reds and blues was arranged so that, in direct sunlight, the windows in dominant blues would interact beautifully with the opposite windows that showcase warm reds and golds. “Finally, in regard to the Stations of the Cross, the precedent established in the Dominican shrines of Spain was continued. Instead of statuary or carvings, large oil paintings were used to depict the scenes of Christ’s via dolorosa. Goodhue decided that these stations should look as if they were old art pieces painted in different countries at different times. One effect of this technique is the ever-changing color of Christ’s robe as one moves from station to station. Telford Paullin and his wife, Ethel, were chosen to create the paintings,” according to the church website. Inside the church, the High Pulpit was installed in 1931. It is composed of quartered oak and formed and is in the 14th century Gothic style. According to Wikipedia, Andy Warhol, a devout Byzantine Catholic attended Mass regularly at the church in the 1960s and 1970s. The pastor of the church at that time remembers Warhol sitting quietly in the back of the church, neither taking communion nor confession. Former Treasury Secretary and financier William E. Simon made contributions to help purchase a Schantz pipe organ. Former Vice Presidential candidate Geraldine Ferraro’s funeral was held at the church in March 2011. The church website has extremely detailed descriptions of the architectural features of the church including panel-by-panel descriptions of the beautiful stained glass windows by Charles Connick.